It’s hard to deny that this Owen Hart DVD was one of the most hotly anticipated WWE DVD projects since they began releasing DVDs 15 years ago! “Owen – Hart of Gold” was always one which fans hoped one day would finally be released, but never really expected would happen. Thus it was one of a very small handful of titles which we here at WDN were really excited to announce was finally coming. Now, there’s the problem with such a highly anticipated project — could it possibly live up to the hype? For the documentary, WWE reached out to a number of different interview subjects including Owen’s family: Bret, Ross & Alison Hart, Jim Neidhart, Natalya and Tyson Kidd. WWE also utilizes a selection of Hart Family interviews from their 2010 DVD. In addition to the family, WWE also has interviews with other superstars (past and present) including: Triple H, Jim Ross, Chris Jericho, Kevin Owens, Mark Henry and even a single instance of Vince McMahon – find out who else is on the list of interviewees in our earlier OWEN WEEK article. In addition WWE also uses an archive interview with The British Bulldog from 1999, which was a pretty cool addition. In discussing interviews, (as we revealed this week) like last year’s Randy Savage DVD, the biggest surprise interview was one from 1996 with Owen Hart himself! While it isn’t too extensive (unlike the Macho Man one), simply having some thoughts from Owen discussing his life and career was always going to be a highlight. The interview appears to have been recorded as part of an international tour as we also have some other little pieces of handheld camcorder footage scattered through the documentary of Owen and other members of the roster. In addition to this, we also have some footage which (I believe) was taped as part of a “Wrestle Vessel” excursion [– Google it] and some live event matches, one of which even included Dude Love and a bag of popcorn! The documentary begins with discussion of Owen’s early career in Stampede Wrestling, his unique (for the time) in-ring style and his eventual arrival in WWE as The Blue Blazer. After this the documentary moves on to discussing Owen’s initial WWE departure, his brief tenure with WCW, his time in Germany and Japan before returning to WWE and the formation of his New Foundation and High Energy tag teams with Jim Neidhart and Koko B. Ware respectively. The next major milestone for the documentary was his feud with his brother Bret, becoming the 1994 King of the Ring, and eventually teaming with Yokozuna and the British Bulldog. This section was fun, as Bret recounts the originally planned storyline (which was to involve Bruce Hart). We also hear stories from Natalya and others about how Bret and Owen would interact with each other outside the ring during this period in which they “hated” each other. Next up the documentary moves with various superstars discussing Owen’s Slammy Awards, the reformation of the Hart Foundation, the incredible Canadian Stampede PPV and what it meant to Owen and the entire Hart Family. This interesting portion closes with Bret’s departure from WWE, how Owen reacted and his stance with the company going forward. The final portion of the documentary looks at Owen’s tenure with The Nation, teaming with Jeff Jarrett, his reluctance to be involved with some of the risqué “Attitude Era” storylines, thus bringing back The Blue Blazer character. Finally the feature very briefly touches upon Owen’s untimely death in May 1999 and then closes with a look at the wresting legacy that he has left behind. In addition to Owen’s story, the documentary is broken up with little segments titled: “Owen Tales”. 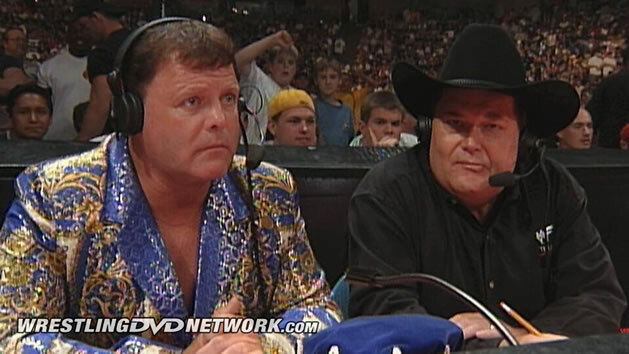 These segments often involve several superstars recounting a story or series of little stories about Owen. These are very nice, however they possibly did hurt the flow of the documentary somewhat. Some of the tales told of course involve Owen’s infamous ‘ribs’ including a tale which involved hogs and Vince McMahon’s office! Even though they were nice, maybe these would have been better as individual extras or “outtakes” rather than being included within the main feature. As I’ve alluded to, the documentary places the vast majority of its 71 minute runtime focused on Owen Hart “the in-ring superstar” with really only the aforementioned segments discussing Owen Hart “the man”. 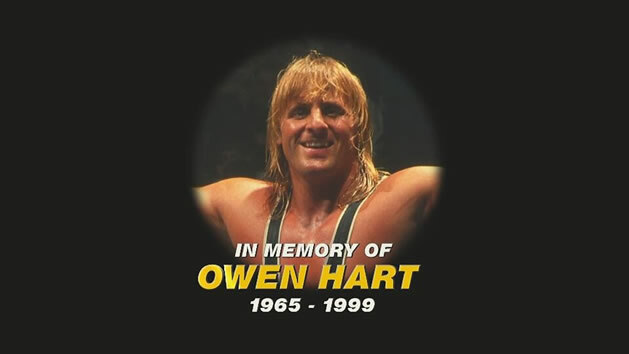 The legal issues between Owen’s widow (Martha Hart) and WWE perhaps meant that the discussion was kept primarily to Owen’s in-ring career and may explain why there are no photographs other than from WWE’s library included within the feature. Sadly, this all means that the documentary is quite pedestrian and I’m not sure that after watching it that I know anything more about Owen than I did prior to watching, which was a real shame. 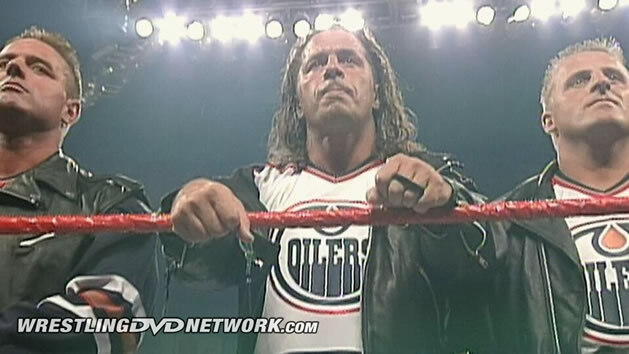 Back in September, when discussing the DVD in an interview with The Fight Network, Bret Hart stated that “[Martha] handcuffed” the project and even called the finished piece “the sh*ts”! At this point Bret hadn’t actually seen the finished documentary and was also incorrect about a couple things (particularly the inclusion of Stampede Wrestling footage). 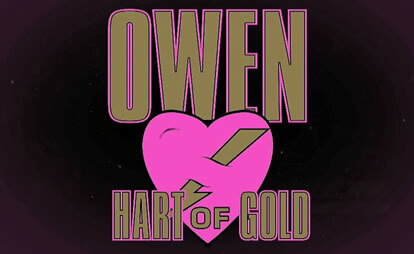 I certainly wouldn’t even consider calling “Owen – Hart of Gold” “the sh*ts”. However, it certainly is missing some of the heart (pun not intended) of other major WWE DVDs which we’ve seen, particularly last year’s big release – “Macho Man: The Randy Savage Story”. In many ways Hart of Gold was very similar to The Randy Savage Story – both documentaries were reliant upon Randy and Owen’s stories being told by their family, friends and colleagues, years after their demise and while both superstars/their families weren’t on great terms with WWE – but Owen’s DVD didn’t turn out anywhere near as good as the Savage one. The documentary certainly wasn’t bad and I’m sure that no one will hate it, but sadly it didn’t quite live up to my expectations. I really think that if you go into this watching Hart of Gold with an open mind and not expect a documentary to the level of Randy Savage’s you will actually enjoy it. Plus, don’t forget, we do have some rather nice special features and unique matches in the complete package as well, and after all these years it is nice to finally see the honoring of Owen Hart’s pro-wrestling career. – UK/Europe: December 7th. Pre-order now through Amazon.co.uk. – Australia: December 9th. Pre-order now through WWEDVD.com.au. Bret Hart would rate this a 4 out of 10. I wouldn’t consider calling Hart of Gold “the s**ts either. But that comment must’ve been from an angry Bret, angry at Martha’s “handcuffing.” Certainly is no excuse for him to comment in that manner though. If it wasn’t for Martha’s “handcuffs”, the doc would’ve been much better. Had she by some miracle participated in the project which she should’ve done rather than using “handcuffs”, the finished product may have been even more better. Considering the “handcuffs”, I think it’s just about as good as it could’ve been judging by the above review. The real sell is the matches included. It’s the best matches listing for any blu ray / dvd of all time. I’m still getting it.can’t wait! Thanks for posting a review ! I don’t think the Randy Savage documentary was great, it was good. However Hart of Gold is a clear step down from Randy Savage’s documentary. i did not think randy savages doc was that bad, but its kinda hard to do dvds like this when the said person is no longer here, and some of the important superstars either don’t wanna do said dvd or are passed as well. this one i sorta figured would be handicapped cause of martha and her issues with this, which i can’t blame her i guess but its been so many years you would think she might wanna start mending the fences but that’s a different story. Also bios are becoming so shorter and shorter these days i dont get it? lawlers, warrior, savage Daniel Bryan,Sting few others have been so short i think last one that was over 2 hours was Triple H from 2013. I though the Savage doc was good but not great. I think it did a great job of covering Randy on a personal level but did a poor job of covering his career since hardly any of his feuds were covered properly. I think an additional 30-60 minutes to the doc would have made it a classic. I have similar concerns about the Owen doc. The fact that it’s just barely over an hour long concerns me. Owen’s doc, even without him being involved in it, should be an easy 2 hours. I am hopeful that it is still decent though. Nice review. I never knew the Savage doc was thought of so highly. I thought it was average since it wasn’t very detailed in discussing feuds. Just a different opinion I guess. A nice early Christmas present for us all!